Mike Craig will be giving us a general introduction to the basic skills used in green woodwork. He will encourage you to see the woodland ecology through a woodsmith’s eyes. Tree selection and sustainable timber use will be discussed as will the connections between green woodwork practices and continuing health of the woodland ecology. Mike’s sessions will help you develop the green woodwork skills needed to create your own kitchen spatula or spoon to take away. You will select a suitable log and cleave the timber using traditional tools and techniques. After roughing out the blanks using a carving axe you will move onto the shavehorse and use a drawknife to create the finished shape of your utensil. Finishing touches will be added with small wood carving knives. Tools used will include froes, axes, drawknives and wood carving knives. The correct techniques of using these tools and working with green wood will be developed and a strong emphasis will be placed on safety. 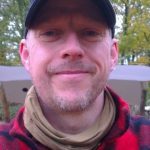 Mike Craig is a green woodworker and woodsman based at the National Trust’s beautiful Nostell Priory and Parkland. He first started training people in the Countryside and Environment sector in the early 1990s. Between 2007-2017 He worked as a lecturer in Countryside Management, specialising in woodland management. He currently works as a self-employed arboricultural consultant when, not teaching greenwood craft courses. He has worked with trees his whole life and is a self confessed tree geek.